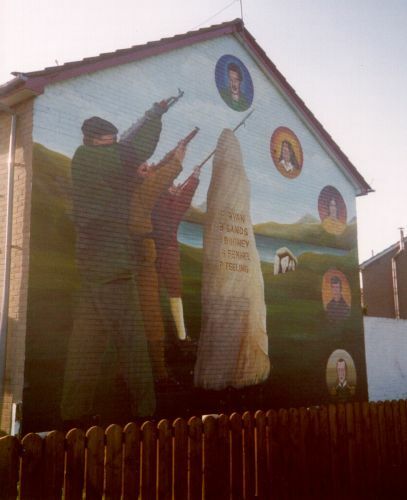 2008 image of 2002’s Easter Rising mural in Berwick Road, Belfast. For the 90th anniversary of the Easter Rising, the mural shown above was painted on Beechmount Avenue, Belfast (aka RPG Avenue). The mural reproduces a 1941 stamp designed by Victor Brown showing an armed volunteer outside the GPO. For more information and the postage stamp, see Raising The Flag. “Freedom fighters outside the GPO – Easter Rising 1916”. Connolly, Pearse, and Markievicz lead the attack on the GPO. Markievicz was in fact at St Stephen’s Green. Side by side in Brandywell Road, Derry: the Easter lily (with “IRA” on one of the flags) and “disband the RUC”.